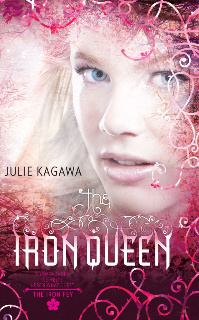 The Iron Queen by Julie Kagawa – It's Time to Read! I thought it was over.That my time with the fey, the impossible choices I had to make, the sacrifices of those I loved, was behind me. But a storm is approaching, an army of Iron fey that will drag me back, kicking and screaming. Drag me away from the banished prince who’s sworn to stay by my side. Drag me into the core of a conflict so powerful, I’m not sure anyone can survive it. This is the third book in the Iron Fey series, and like the other two, I loved it ♥ Once I had started reading it, I could not stop. At the beginning of this book Meghan is in exile from Nevernever because she chose to follow her heart, and her love, Prince Ash, who had been exiled for falling in love with her. Together they are in the human world, happy and alone. Until they are attacked by iron fey. They are quickly summoned back to Nevernever and receive a pardon, on the condition they take down the iron fey and the false iron king. This they agree to, and quickly war is on the cards, and Meghan has to battle and win, as being half-human she is the only one who can withstand the iron. This book was amazing. Right from the start there was action. War and battles run throughout the book, making it exciting and fast paced. This book is different from the others in that this time Ash has given himself to Meghan, whereas before he was hiding his love. Their story and relationship flows alongside the story but this isn’t a problem, especially as after most love scenes along comes Puck with some sarcastic remark. The imagery in this book is incredible. The descriptions of the faery land is beautiful, and it is so easy to picture this world. This is a fantasy book with dragons, dwarfs and gremlins but the way Kagawa writes makes it very accessible and I was transported from my chair to this world and quickly forgot it was make-believe. The characters are great. I love Meghan. She is strong and determined. She didn’t give up and always did what was best. Puck made me laugh the whole way through. There were some touching moments with him but mainly I just enjoyed his wit and humour. My favourite character, as before was Ash. Strong, silent, brooding, and so easy to fall in love with! I’m easily Team Ash! I loved seeing a whole new side to him in this book, where he let his feelings for Meghan show. Grimalken the cait sith is great. He is exactly how I imagine cats would be if they could talk. Arrogant and only around when it benefits them! Together they make a great team. I was intrigued by the ending and the role Meghan has taken on. I like the twist, it will change the direction of the story which is great. The epilogue and the suspense is already killing me! After the great battle I was almost in tears but this new spin has made me excited already! This is classed as a young adult book but I loved it. I empathised with the characters, I was gripped the whole way through and I just loved it. There was action, fantasy, imagination and a bit of romance and it made for an extremely satisfying read. I cannot wait for book four! I just want to know one thing. Does Ash die? Please answer honestly. Oh my. I just finished The Iron Queen and there is indeed a cliff hanger. *SPOILER ALERT* no he does not. I read the iron king, the iron Daughter, now i’m reading the Iron queen, then i’m gonna read The Iron night. I love the Iron fey series! I read the iron king, the iron Daughter, now i’m reading the Iron queen, then i’m gonna read The Iron knight. I love the Iron fey series!